Without too much time before WWDC 2013 begins in San Francisco, I figured this was the last time I could pontificate and hypothesise about the potential future of the Mac Pro. Nobody has talked about this, so it’s a perfect opportunity. The Mac Pro is an interesting odd man out in Apple’s lineup. In an ocean of iPads and iPhones and iMacs and Mac Minis with their consumer hardware and enclosed batteries, the Mac Pro practically begs to be tinkered with, upgraded and extended. I mean this literally. 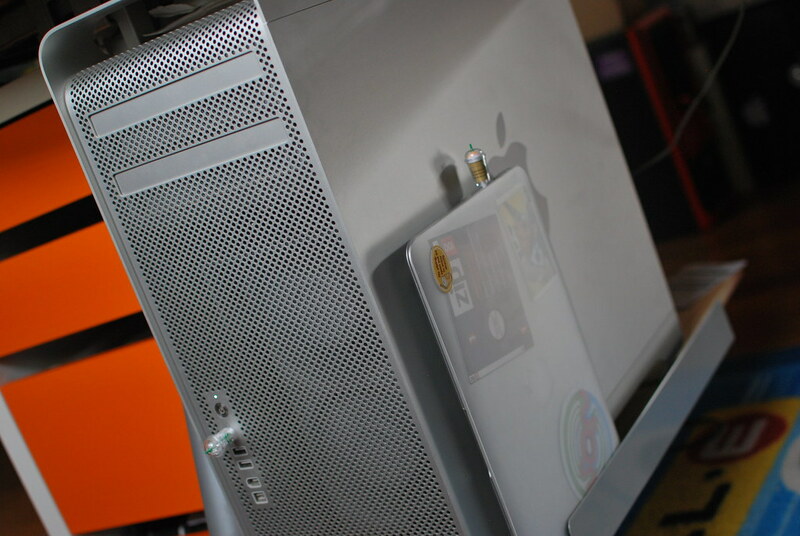 As I blogged extensively about in 2012, I’ve build dozens of PCs in my time, and NO case I’ve ever purchased, seen and/or used match the pleasure of upgrading a Mac Pro. There are no messy cables, no awkward catches or screws. The hard drives mount on sleds, the RAM and Xeon CPUs rest on daughter cards that just slide in and out. It’s a thoroughly Apple machine, with every last detail teased out and perfected. Competitors and Apple detractors scoff and such user expeirence detail, but it really comes through in their products. Apple cares, and few others do, it’s as simple as that. Problem as, as many nerds have lamented over the last few years, the Mac Pro has been sorely neglected. Intel’s Xeon architectures have continued to advance in leaps and bounds, and the Mac Pro has stood behind, watching the future fade into the distance. From podcasts to blogs, I’ve heard several theories as to why this is. The current Xeon platform can’t easily transfer dual Thunderbolt/DisplayPort interfaces on PCI Express. Apple were concerned about releasing a machine capable of driving a retina display. To say nothing of the problem with bare fans that prevented their manufacture and distribution in Europe of late. Then last year, in a phrase that has received more scrutiny by the Mac tech nerd press than anything in a long time, Tim Cook announced there “would be something” for us fans of the Mac Pro this year. Not that there would be a new Mac Pro, but that we’d be delighted by what they have in store for us. I share similar jitters with my fellow Macheads. My MacBook Air is my sleek little starship I take around with me, but my Mac Pro is my space station. No more masses of enclosures, cables and power bricks everywhere, just a single monster tower with all my hard drives and data, and a gigabit Ethernet cable to talk to it. I like the analogy of a space station. It doesn’t need to be nimble, small or sleek, because it’s just sitting there being full of awesome. The little starships in my family fly around the place with us, then return home to dock with the Mac Pro to back up their data, transfer downloaded podcasts and other media. Assuming Apple replaces the Mac Pro with something at the Moscone Centre today, I can only hope they maintain what’s so wonderful about this machine for their power users, scientists, media editors, developers, tinkerers and data hoarders (ahem). It’s an unapologetic UNIX workstation that can swallow all the drives and tasks we throw at it, executed with the hardware design and elegance only Apple bothers with. I suppose we’ll soon see what they have in mind. Mind open Ruben, mind open! Newer post ← A long overdue au revoir to aterm!